Glowing luminarias outline El Santuario de Chimayo, Chimayo, New Mexico. Blessed is how I’m feeling on a bitter cold December evening while visiting El Santuario de Chimayo. The list of blessings, for this night alone, is numerous. My journey on the back roads of New Mexico has been safe with a few extra stops along the way to capture unexpected beauty. 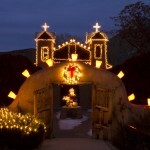 The goal to photograph El Santuario grows into two nights of shooting. Night number one was special. The second night…extra special. As the sun sets I find myself all alone at El Santuario de Chimayo. An immediate realization of how special this moment is comes over me. This photographer’s prayers for solitude have been answered for my second evening of shooting. No worries of catching moving people during long exposures needed for evening photography. No pressure of being in anyone’s path. Alone with my thoughts on how best to capture this magnificent setting. A photographer’s dream come true! A calming silence surrounds me. It is so quiet I can feel the energy of the millions of whispered prayers left behind. I’m reminded of wisdom given me the night before by Louise. I put aside my camera and become completely still. Drinking the scene and serenity of the moment into my soul. **Thank you, Louise, a photographer sometimes needs reminding.